Peaceful Reader: Weekend Cooking; Road Trip to peace. Yesterday I had melted Brie, fresh bread and apple slices. There was chaos getting to that peaceful spot though. Groovy Girl began the day sad causing waves of tears and snappy answers from her. It took us a bit to convince her she could take charge of her own mood. She did and we went off to skating a bit late but still there. After her skating lesson, Husband and I had a planned road trip with friends and I was excited to go. A few days earlier husband found out about a peace walk and wanted to participate. Of course, the timing of the event squeezed it right in between skating and our intended road trip, which makes handsome husband think "oh, great we can make it!" Ugh. Love peace, Hate rushing. I often walk laps around the arena while Groovy skates and I needed a shower and I had less than 30 minutes to get ready for the walk and the road trip. Could I have planned more the night before? Yes. Did I? No. In my rush I spent 3-4 precious minutes trying to get new milk from Hansen's into the refrigerator cramming it between various water bottles. I should have taken water bottles out but instead somehow managed to spill the small pitcher of margaritas I'd made the night before. I cried as the mason jar spilled it's contents all over the kitchen rug. Now I had to stop and wipe it all up. What a waste. It wasn't the loss of the drink (well a little bit) but I dislike rushing and the affects of rushing. I did make it up to take my shower and even though I was sad about spilled "milk" I knew it wasn't the cause but I still managed to have another mini-meltdown as I was driving back down the highway previously traveled for skating. 1. My children are old enough to be on their own together but it was my first time leaving them for the day without my mom or someone else to consult. They would have to take care of chores, and lunch and dinner on their own. They survived. 2. My husband and I have walked, prayed, rallied for peace from Arkansas, D.C. and Iowa. Of course he would want to walk this walk. The walks purpose is to highlight a Dr. King park we hope to have built in our church neighborhood. Even though my tears and my brain fought it; the walk healed me and reminded me of what I know to be true. My life is good and we need more peace in our communities both locally and worldly. I left my grumpy bugs behind. Our road trip with friends to the Amana Colonies was fantastic. We went to Fireside Winery for a tasting, shopped, (I bought pecan maple syrup at the General Store) and root beer here and enjoyed the company of our friends and the fantastic autumnal weather. At both winery and Millstream we were able to sit on the patio with just sweaters. We had a delicious family-style dinner at The Ronneburg Restaurant, which included sides of sauerkraut, German potato salad, beets, coleslaw and dark rye bread. My grandmother would have loved it! The meal was good but the Brie on the patio was my favorite part of the day. Sunshine, a light white wine and laughter made me forgot all about my meltdown. Use the frozen limeade can to measure ingredients. Mix well in a gallon pitcher. If you would like to blend them; don't add the water and blend. Either way serve in a small glass, with limes and salt. Perfect. Fall is not margarita weather here but our school published a new cookbook (our second one) and my school friend, Stephanie, had this brag-worthy mix. We toasted together on Friday night while we watched the Cardinals win the World Series. Yeah!!! 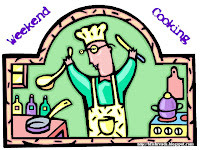 This crazy long post is linked to Weekend Cooking hosted by Beth Fish Reads.